Gone are the days of dominant big men being the key to success, giving way to “small-ball” with point forwards and stretch bigs. Eight 2001-02 NBA All-Stars played the centre position and were true post players, compared to only six centres in the 2010-11 All-Star Game, of which three were proficient mid- to long-range shooters rather than the traditional post-up big men. 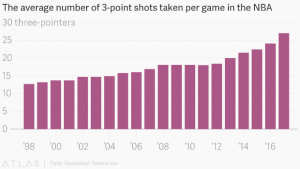 In the following 2012 season, NBA teams shot an average of 18.4 three-point shots per game, which had risen by four shots per game since the 2001-02 season. Just five years later, this number rose by 8.6 attempts per game, to an average of 27 attempts in 2017. But what caused this increase? Can it be described by the shift to small-ball? Has the three-point line been moved, or perhaps the size of the rim changed? In fact, this increase can be attributed to analysis. Analysis that showed a three-pointer has a 35 percent chance of going in, leading to more points than a two-point jump shot taken closer to the basket. This has resulted in coaches placing a higher importance on players who can effectively shoot the three-point shot and encouraging them to take it. So it is no surprise that the last 10 Most Valuable Player (MVP) awards went to point guards, shooting guards and small forwards – those who take the most three-point shots. Basketball is far more complicated than the well-known story of Moneyball within baseball because of the open-ended interactions between the players on both teams. Historically, simple metrics such as points scored, turnovers and rebounds were the limit to insight. However, in 2009 the league implemented an on-court video system, able to track every player and the ball on the court. This has created a far richer source of data for coaches and analysts to better understand the on-court interactions through advanced analytics and artificial intelligence, providing the ability to quickly understand all this historical data and identify patterns, relationships and trends. These insights can then inform decisions on tactics, lineups, training schedules and travel. With professional sport being decided by small margins, these benefits were naturally widely accepted across the league, and new roles began to arise within teams. Previously advertised roles at Liverpool Football Club, Swansea City Football Club and LA Galaxy Football club are just a few examples of clubs looking to derive this value . As a result, teams will need to form a data strategy, acquire specialist software to help manage and govern their data effectively, and foster collaboration across all departments. Fortunately, SAS can provide these abilities and, as a result, is being used by a number of basketball teams. What about the wider world? Most interestingly, it’s not just basketball or baseball taking advantage of analytics. Professional sport globally is embracing the benefits of analytics in the locker room. From within the white lines, analysis is being used in two main ways: performance analysis and physical analysis. Football, for example, has been using GPS monitors for physical analysis, tracking a multitude of metrics describing a player’s movement in matches since the 2015-16 season, and in training years before this. This allows the training and coaching staff to get a better view of an individual’s readiness to train, reduce the chance of injury and better design training. In addition, new technology is threatening to revolutionise football even further. Like the on-court cameras used in the NBA, SAS® is being used on cameras around football stadiums to track all players and the ball to the nth degree by SciSports’ Ball James system. 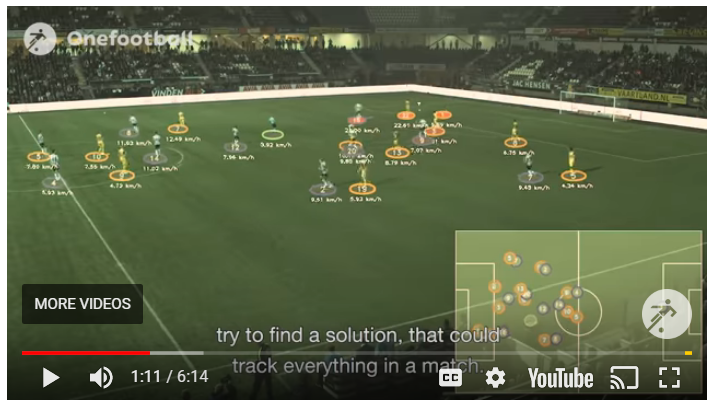 These cameras are able to produce detailed data never perceived before: what part of the body contacted the ball, whether the team is playing the formation prescribed by the manager, and even the true potential of a player. Combining these two elements allows for a much greater knowledge of what interactions are taking place on a pitch, their effect on the desired outcome of a victory and how to alter determinants of that to the advantage of a team. SciSports’ Ball James system tracking all players on the football stadium and the ball to the nth degree. This post has focused on how analytics has shaped the world of sport, within the white lines. However, it could just have easily been written to reflect the changes being made outside of them, including fan engagement models and dynamic ticket pricing. Nevertheless, it still raises some questions. What will the competitive edge be for teams when analysis becomes so widely available? Will fans still sit and watch matches for 90 minutes if we know there’s a 95 percent chance it will be a 0-0 draw? And finally, and perhaps most importantly, will analytics remove the very thing that makes sport so appealing – its unpredictability?